Just arrived at the One Fat Frog Restaurant Equipment Super Mega Warehouse in Orlando are several used refrigerated prep tables. Brands of refrigerated prep tables include True, Victory, Hobart, Delfield, and Cold Tech. Sizes range from 27″ to 98″. Several pizza prep tables are available featuring cheese sifts, raised backs, and plenty of room in the front to prep pizzas, subs, wraps, etc. Here’s a look at some of the standard features you can find on refrigerated prep tables. Refrigerated prep tables feature different sizes and configurations. These refrigerated prep tables offer between one and four doors, and may provide up to eight shelves or drawers for storage. The interiors of refrigerated prep tables commonly accommodate between six and 15 pans, depending on the model of refrigerated prep table. All models of refrigerated prep table come with stainless steel exteriors. Stay-open doors on refrigerated prep tables enable easy loading. The evaporator fans in some refrigerated prep tables offer motors with automatic delay features that stop them when the doors open. This prevents condensation from developing by mixing cold interior air with ambient air pressure. 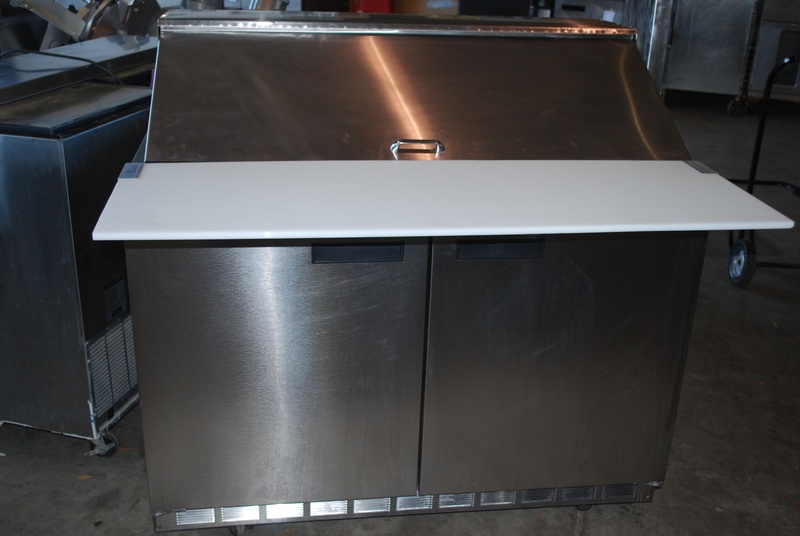 One Fat Frog Restaurant Equipment welcomes package deals and quick cash deals towards the entire stock of used commercial restaurant equipment, including the super sweet used refrigerated prep tables mentioned above. One Fat Frog Restaurant Equipment also has an easy finance program that can get anyone approved no matter what shape your credit is in. One Fat Frog Restaurant Equipment offers more free delivery to more parts of Florida than any other used commercial restaurant equipment dealer in the Sunshine State, One Fat Frog Restaurant Equipment also offers free custom cutting boards for refrigerated prep tables!